First time in 62 years: Hundreds gathered for emotional Sabbath prayers at the renewed, majestic Hurva synagogue in the Old City of Jerusalem. First time in 62 years: Hundreds gathered for Sabbath prayers at the renewed, majestic Hurva synagogue in the Old City of Jerusalem. Puah Shteiner, who spent her early years in the Old City’s Jewish Quarter and was exiled as a little girl when Jordan captured and largely destroyed the area, was one of hundreds who returned to the newly-rebuilt Hurva Synagogue this Sabbath for an emotionally charged, historic experience. She and her husband Rabbi Chaim Shteiner, a leading rabbi at Yeshivat Merkaz HaRav, were one of the first Jewish couples to move into the refurbished Old City quarter following the Six Day War in 1967. 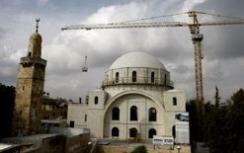 “We truly felt that the rebuilding of this synagogue for the third time means that we are now ready for the third rebuilding of the Holy Temple,” each of them separately told Israel National News. They are not the first to make the connection. Some 200 years ago, about a century after the synagogue was destroyed for the first time, newly-arrived students of the Vilna Gaon in Jerusalem began rebuilding it – after their saintly and renowned teacher taught them that that would be part of the Redemption process. The prayers this past Sabbath drew people from all over the city, including the Dean of Yeshivat Merkaz HaRav, Rabbi Yaakov Shapira, and the co-founder of Yeshivat Birkat Moshe in Maaleh Adumim, Rabbi Yitzchak Shilat. “There were women there of all religious stripes – in fact, the women’s section is a bit small,” Mrs. Shteiner said. “It holds only about 60 women, as it did until 1948. Apparently the designers didn’t take into account that more women go to synagogue now than did then…” The men’s section has 200 seats. The prayers will be held according to Ashkenazi custom, in accordance with the long-standing tradition at the Hurva. Rabbi Simcha HaCohen Kook, Chief Rabbi of Rehovot and grand-nephew of the saintly Rabbi Avraham Yitzhcak Kook, will be the synagogue's rabbi. He delivered a special address there in the afternoon. Day-to-day operations will be handled by a group associated with the Zilberman yeshiva in the Old City; the prayers for the State of Israel and the IDF will be recited every Sabbath. As the Sages teach, "Whoever brings joy to a bride and groom is as if he has rebuilt one of the ruins of Jerusalem" - and, apparently, vice versa. In its first week of operation, the synagogue has already seen its share of joyous occasions. In addition to two britot (ritual circumcisions), a young couple – an American who made Aliyah without his family and is now serving in the army, and a girl of Ethiopian extraction – was married there this past Tuesday night. Because of their paucity of both relatives and means, they originally feared that their nuptials would be little more than a brief ceremony – but in the end, they "chanced" upon the Hurva on the day it was dedicated, and were treated to a large and joyous wedding with hundreds of people, musicians from the dedication ceremony, and food donated by a local restaurant. As the Sages teach, "Whoever brings joy to a bride and groom is as if he has rebuilt one of the ruins of Jerusalem" – and, apparently, vice versa.